So I’ve just been throwing up all of these tools, activities and exercises for V’s fine motor development without any real structure as to how we actually do them in our day to day lives. I should be clear that we do not spend hours and hours a day doing these ‘games’ because A) V would be hella bored and B) I have a 10 month old who doesn’t appreciate that much free time. The reason we have so many different games and activities is so that we can switch it up every day without doing the same things for the next year or longer if that’s what V needs. The Scissors and Pre-writing activities are pretty set, however V can chose the activity book and page he wants to colour. 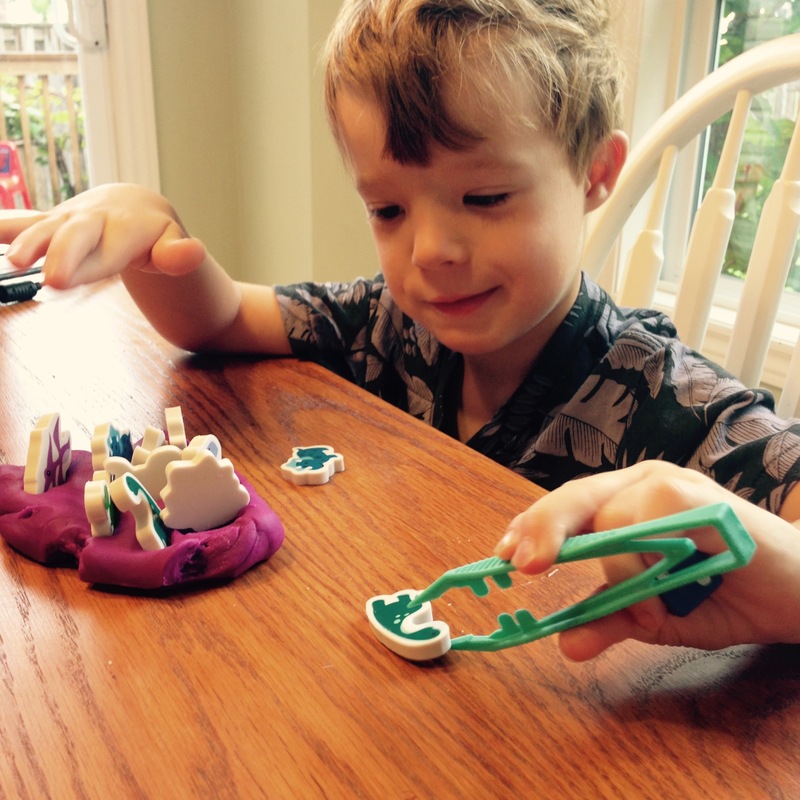 The other activities he’s able to chose from our Occupational Therapy Kit. He gets pretty excited about all the options but definitely has his favourites! The only time I step in is if we’ve done the same activity for 3+ days in a row, so that he’s not just practising one individual set of skills, but is able to apply them across the board! We do all of his activities in one big chunk of time in the morning because it’s when he’s got the most focused energy (any teacher will tell you all the most important lessons take place before lunch!) 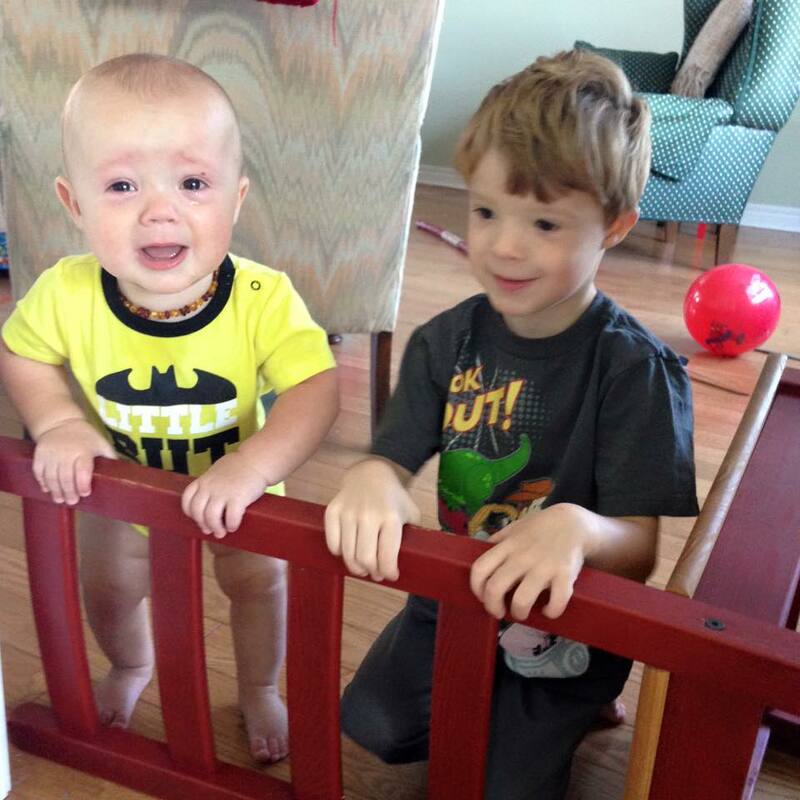 and his baby brother is happiest after breakfast! That way we can make other exciting plans for our afternoon and don’t have to worry about trying to come back and ‘finish up’ anything we left out. Typically, as a ‘reward’ for concentrating and doing well on his OT games, V and I will play a rousing round of Mario Party 10 on our WiiU. I know that it’s become a huge bone of contention with a lot of people; kids and screen time, however video games are actually a pretty awesome fine motor and hand/eye coordination activity! A round of Mario Party only takes about 30 mins and trust me, V has no idea he’s even practising moving his hands separately. We’ve tried playing actual board games but V has trouble picking up and moving the small pieces. It usually ends in frustration and an incredibly short attention span, so Mario it is! There you have it: Our daily OT routine! Any feedback is appreciated and I’d love to hear how you spend your Occupational Therapy time!! Until we started having V evaluated for fine motor issues I never realized how those delays would affect his every day life! At (almost) 5 years old you don’t see it used much beyond writing and colouring but when you start some of the exercises you really see how these difficulties could extend to different areas as he grows older. For this next activity just imagine trying to put together some Ikea furniture if you couldn’t manipulate your hands/fingers correctly. And you thought assembly was already a pain the ‘you know what’! Yup OT supplies can be purchased at the hardware store too! Our Nuts and Bolts courtesy of Home Hardware! ** Again these type of activities help V build the coordination and strength in his fingers. 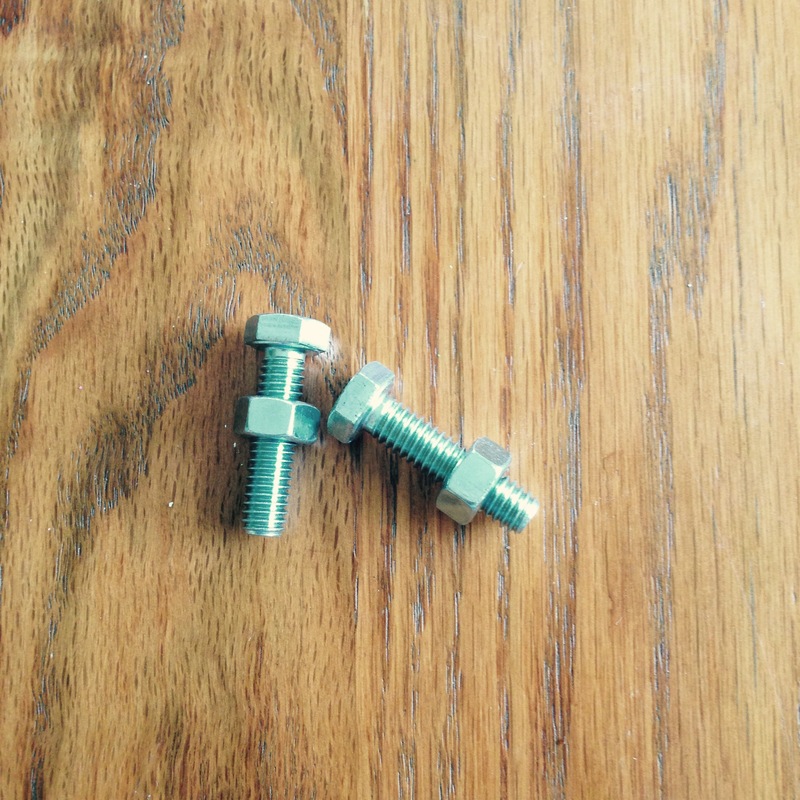 Twist the bolts onto the nuts at two different points. Have your child use their non-dominant hand to hold the nut and the dominant (writing) hand to twist the bolt until it drops onto the table, making a loud bang! Twisting the bolt so it will drop onto the table top. Repeat with the second nut & bolt set. If your child is really into the activity you can have them try to replace the bolt onto the nuts using the same hand motions. Buy nuts and bolts with a wider width. They’re pretty cheap so as your child masters the task you can go buy thinner ones later on but to start you’ll want them to experience success! V loves the surprise of the loud BANG! when the bolt hits the table. 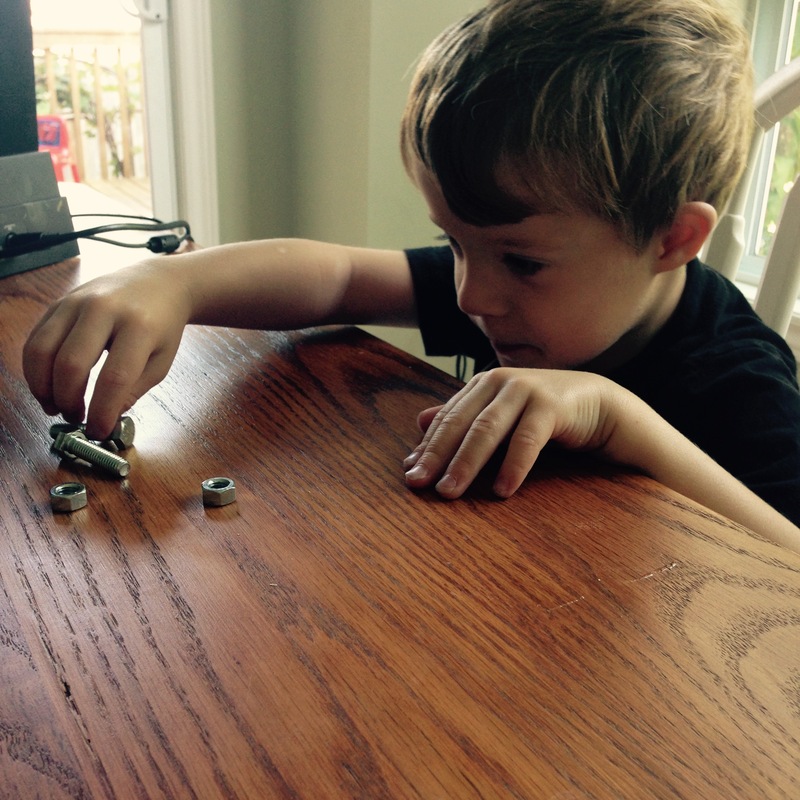 He thinks it’s hilarious and it also encourages him to try to hold the nut and bolt still over-top of the table as he works on turning the bolt. This is our second purchase from fdmt.ca. As I mentioned previous, most of V’s materials can come from discount or dollar stores but the Grotto Grip was another exception. 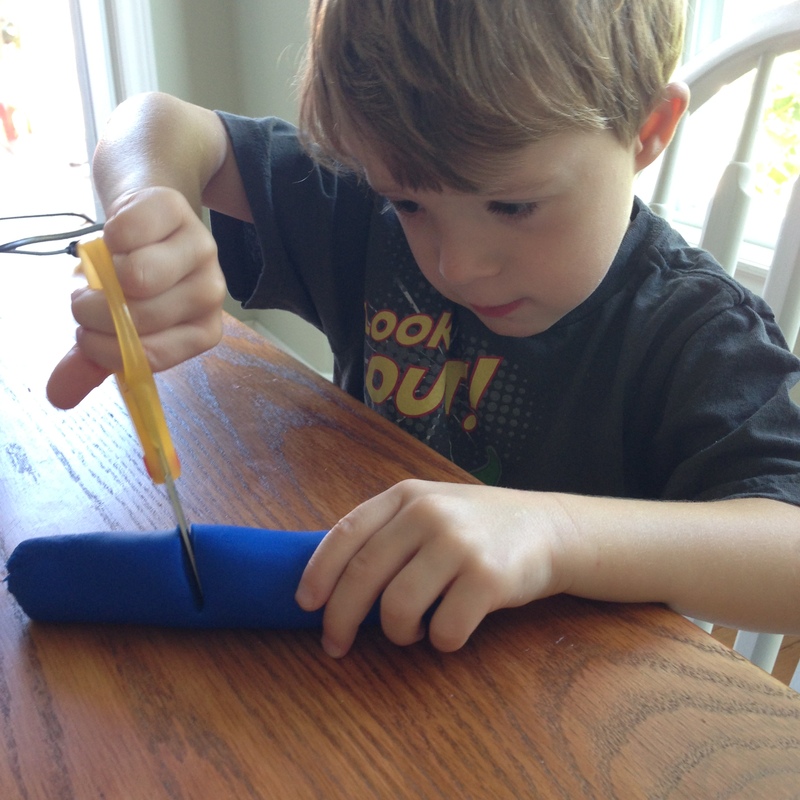 Our OT recommended it because it attaches to his pencil, marker, crayon, etc to help him maintain a proper grip. There were a few grips she considered for him but did eventually decide that the three-point grip would be the most beneficial. 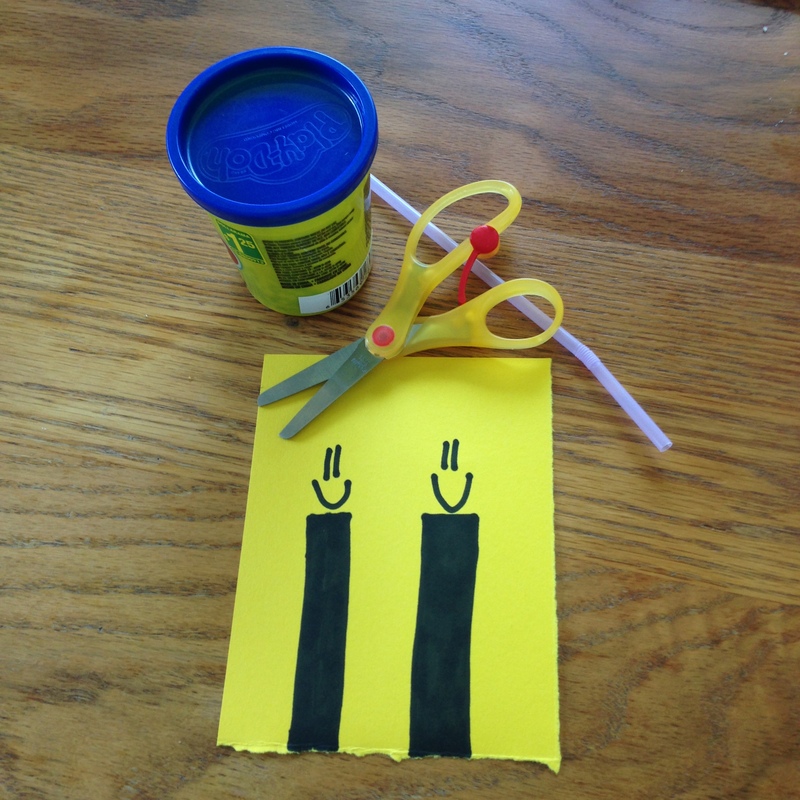 She let us know that a few stores in our area did carry a version of this particular grip, but she’d found they didn’t work quite as well for children with fine motor issues and since we’d be ordering the scissors anyways….might as well add some more! 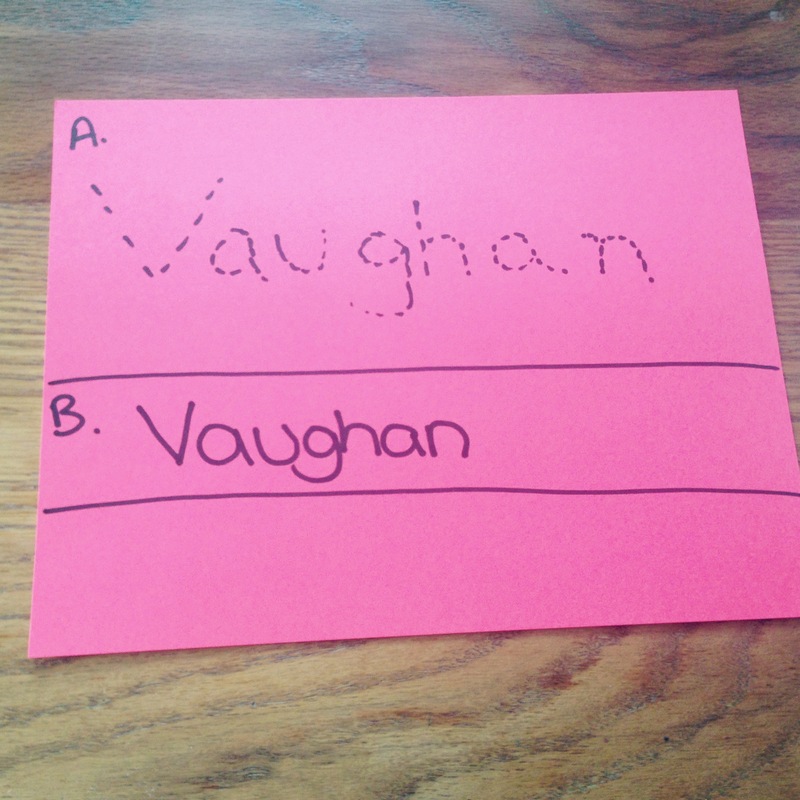 I was really excited to see how these worked with V because, as a general rule, he HATES to colour or draw. He would scribble as fast as he could, and then tell you he was done. If you wanted to pull out some colouring books his attention span would last for all of about 5 minutes before he was running around again. This may have led to some speculation in the past that he had behavioural issues, however now that he’s been properly diagnosed we know that it was purely frustration and boredom. How much do you like being force to do something you’re not good at or find incredibly hard? Can’t blame a pre-schooler for letting his feelings be known! Anyway, I was excited to try them out and see what type of change it would make in both his skills and his attitude. 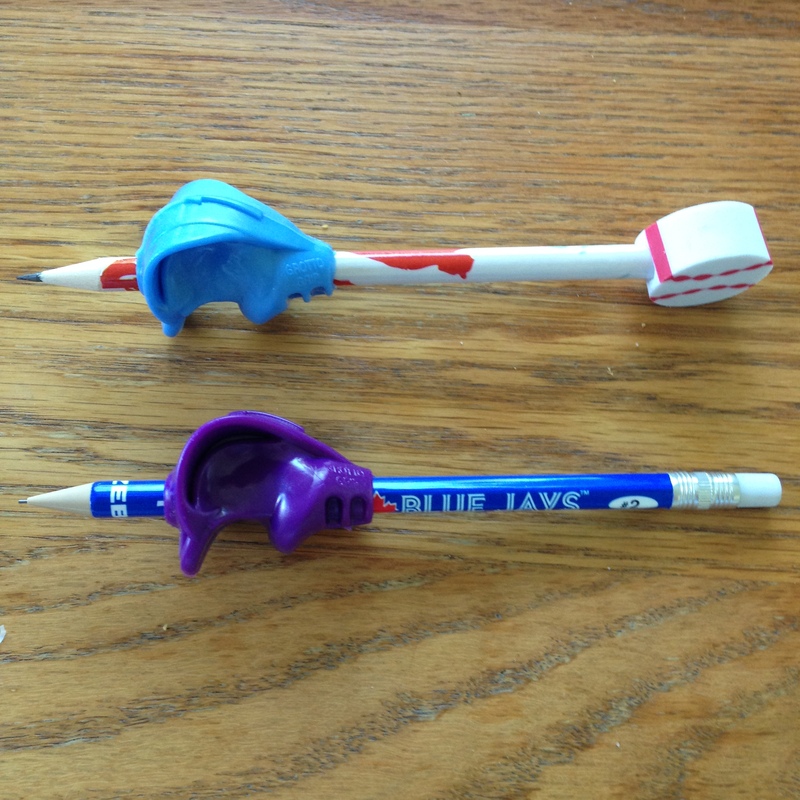 Here is a highlight of what our pencil grip/pre-writing program looks like. Grotto Grip! V prefers the blue but we also have black, green and purple! It slides onto the pencil/pen/marker etc near the tip and is essentially a plastic mold that, for all intents and purposes, forces, his hand into the proper grip with his thumb and forefinger ‘pinching’ the sides of the instrument and a cradle for his middle finger just below. We keep his other two ‘stabilizing’ fingers busy by holding the same object he would for any of our ‘pencil grasp’ OT exercises. V also gets his choice of pencils for his daily activities. Choice choice and more choice is key! 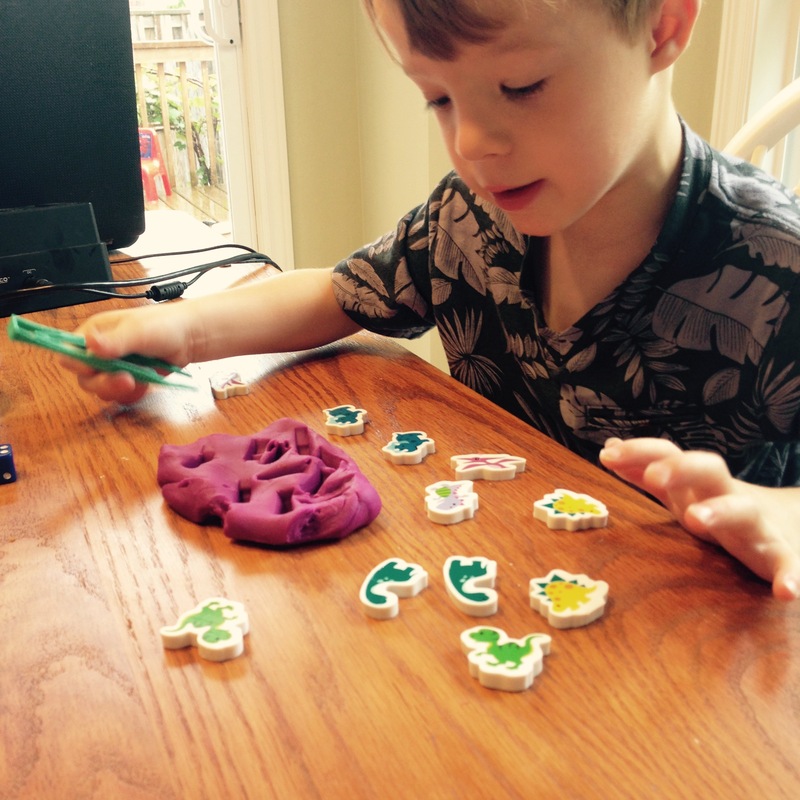 V’s OT told us that ‘Connect The Dots’ puzzles and mazes are amazing activities for children with fine motor issues. They make them practice drawing firm, straight lines as well as constantly changing angles and adjusting their grip. V loves them so we’ll pick one a day to do together. It’s also a great way to practice his numbers and counting! You can find this stuff everywhere if you’re looking. 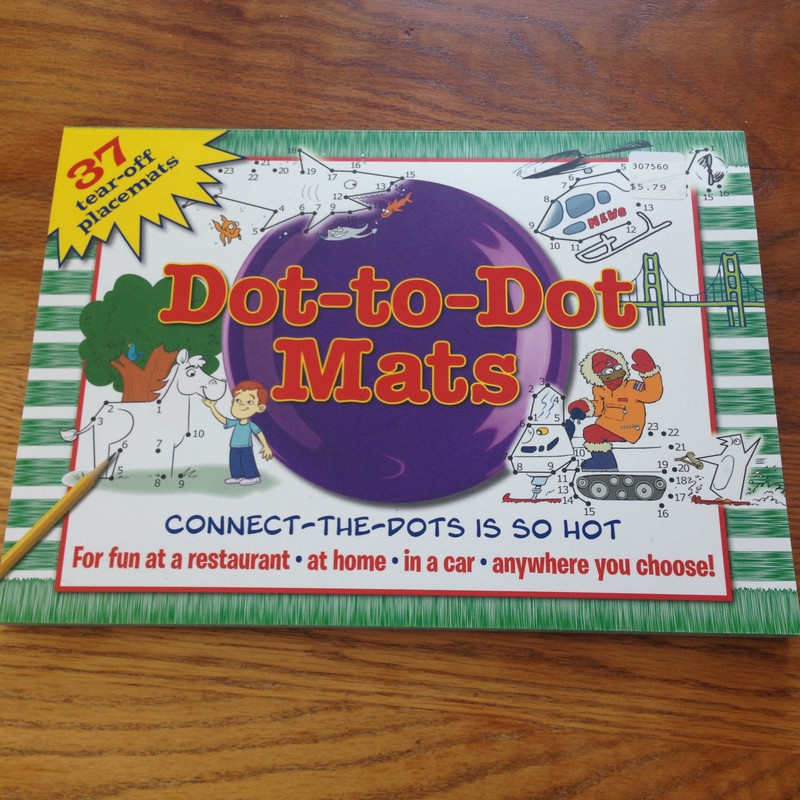 This booklet is full of ‘Connect the Dots’ place mats! V is also practising his grip by learning to colour inside the lines and switching his grip between different coloured pencils. We usually colour our ‘Connect The Dot’ picture once we’ve completed the first part! V has about 4 different colouring books in his OT kit so he gets to choose which one he’d like to do for that day. V isn’t at this point yet since we’re still trying to get him practising his grip but we will eventually move into repeating the tracing/copy activities from his OT assessment. 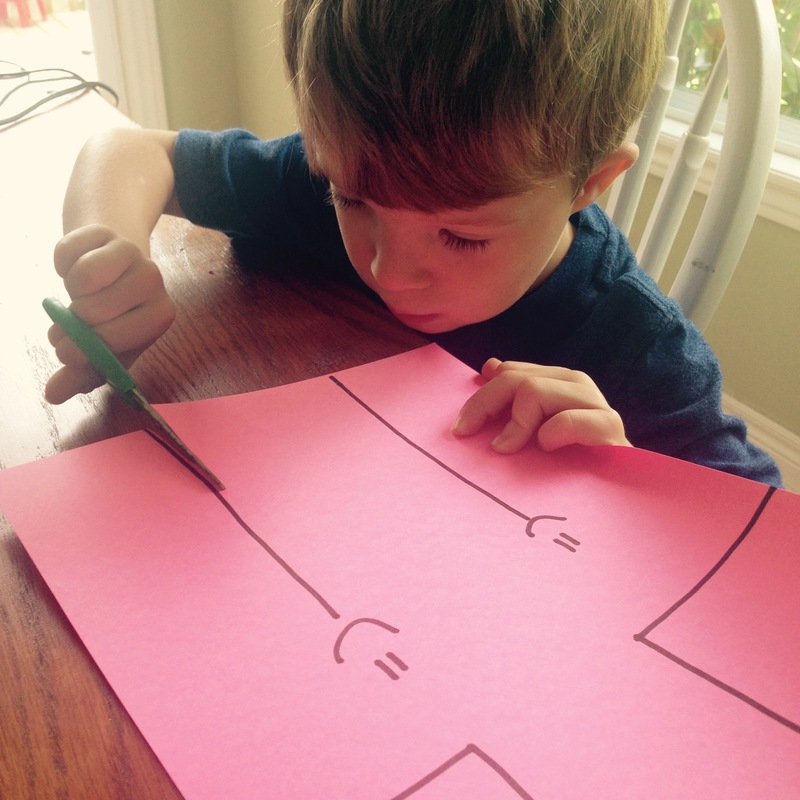 V will practice tracing and drawing simple finite shapes like X, T, O, squares, triangles etc. Tracing lines between matching pictures and their shadows. Who doesn’t love Transformers?!? Also not an exercise we’re doing right now but V will also soon start tracing his letters in workbooks and trying to write his own name! We have to keep the end goal in mind here! We purchased 4 Grotto Grips from the website. 2 are for home use and 2 will be sent to school, labelled, for V to use when they are doing any drawing/writing lessons there. Make sure you continue to use a stabilizer for all of the writing activities. Just because your child has the grip for the first three fingers, they also need to learn to use the other two to help stabilize their hand as they go. The Grotto Grip in action! You can’t even see the stabilizer hidden under the outer two fingers now! He’s learning to close that fist. 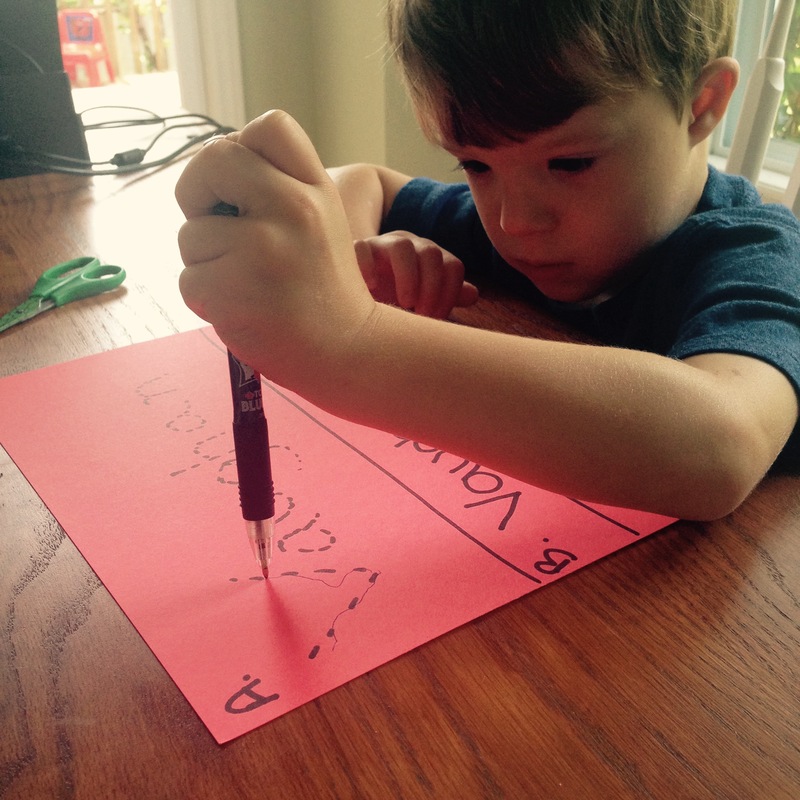 Encourage your child to use their other hand to hold the paper and move it along as they draw/write. Part of the writing skill is using their hands cooperatively! Choice is important! 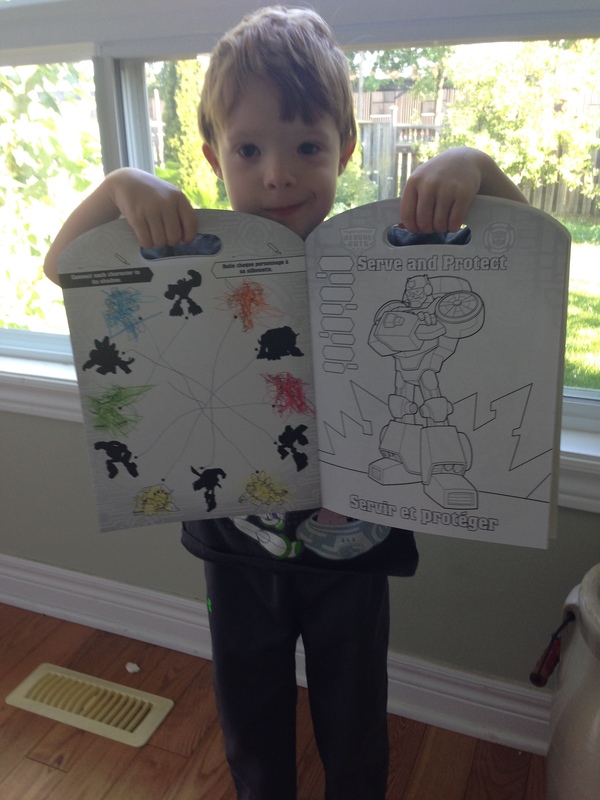 Have a variety of workbooks/activities for your child. Again, it’s all about getting that buy in to produce the sense of control and the feeling of success! This is a sample of our writing activity choices! Kids really appreciate that small sense of control so make sure you provide options. Invest in some magnets! 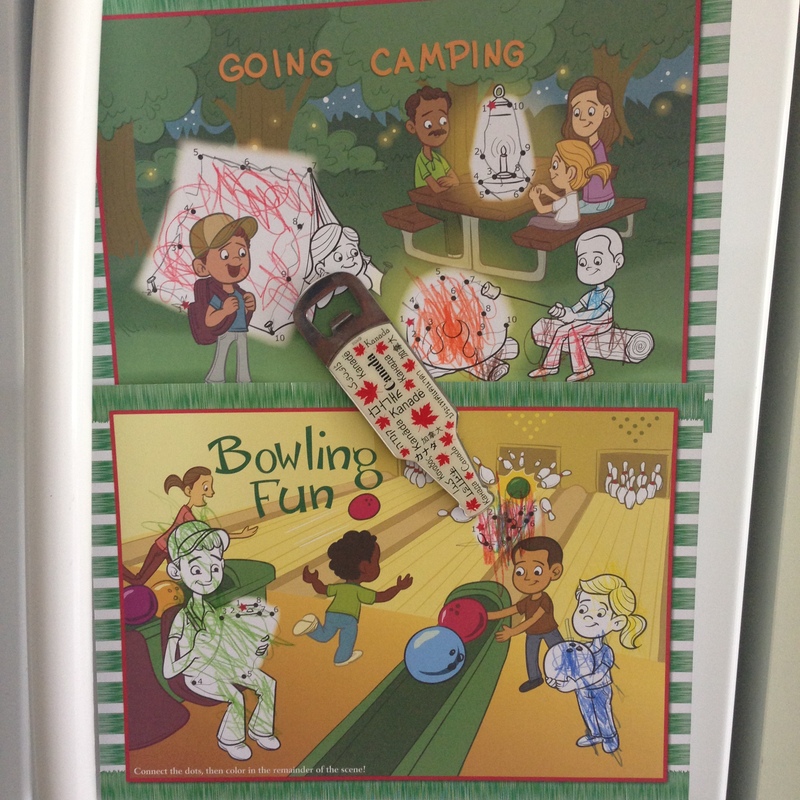 V loves the ability to display his work on the fridge when he does a new, exciting activity! Pride in their work is important especially when learning new skills. Look at what I can do! He is so proud of his accomplishments. I can’t say enough great things about this tool! Even after 3-4 days of use I can already see a HUGE improvement in V’s grip and his abilities. 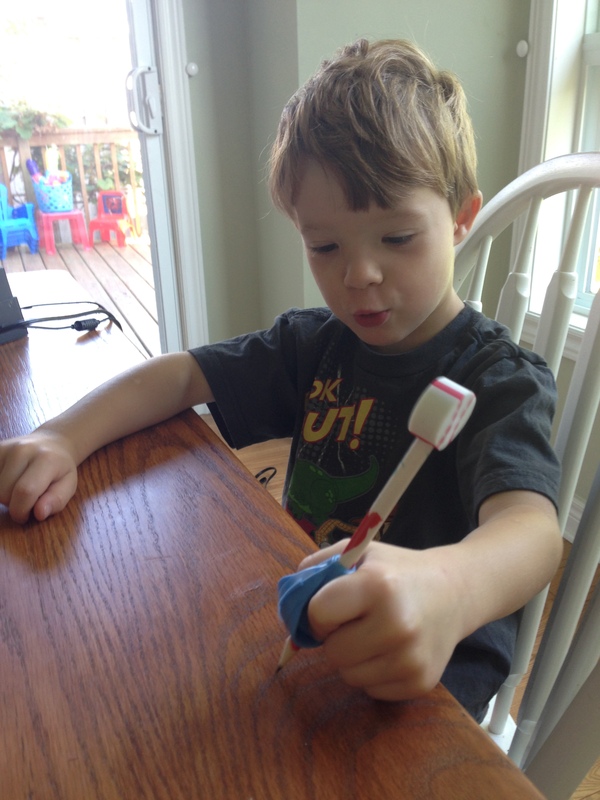 He knows how to hold the pencil with confidence and is able to exert more pressure as he makes his marks. His lines are darker, straighter and more firm. 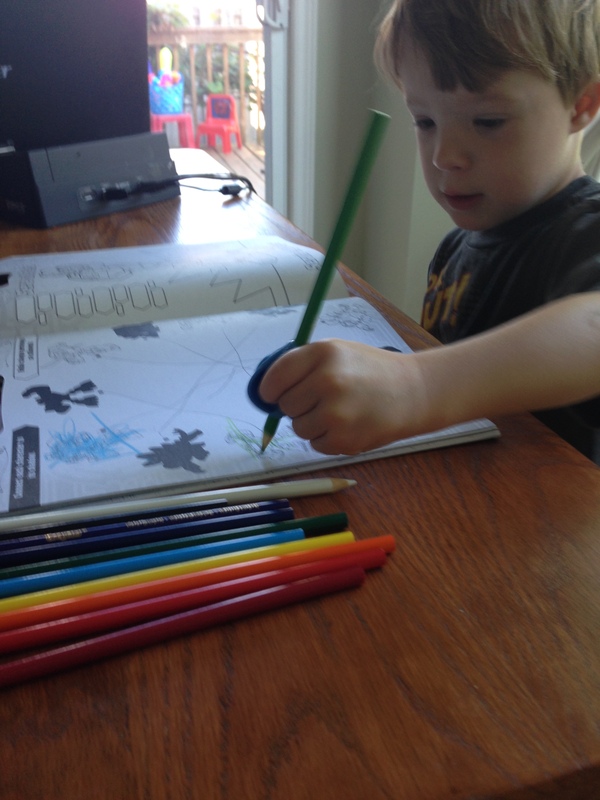 He can also colour much close to the lines, tries to colour in smaller shapes and will actually sit and colour for more than 5 minutes at a time! He is rarely drop his stabilizer now and he looks forward to our craft time each day. As least from my end the Grotto Grip is highly recommended!! I have never, in almost 5 years, seen V draw such straight, firm lines. I almost cried and I definitely sent out a picture text to Daddy. We were given about 5 sheets of exercises to help develop V’s fine motor skills and these came with a fairly large shopping list of supplies we’d need in order to complete the tasks. Most things could be purchased at the Dollar Store but there were two notable exceptions: spring-loaded scissors and something called a ‘Grotto Grip’. 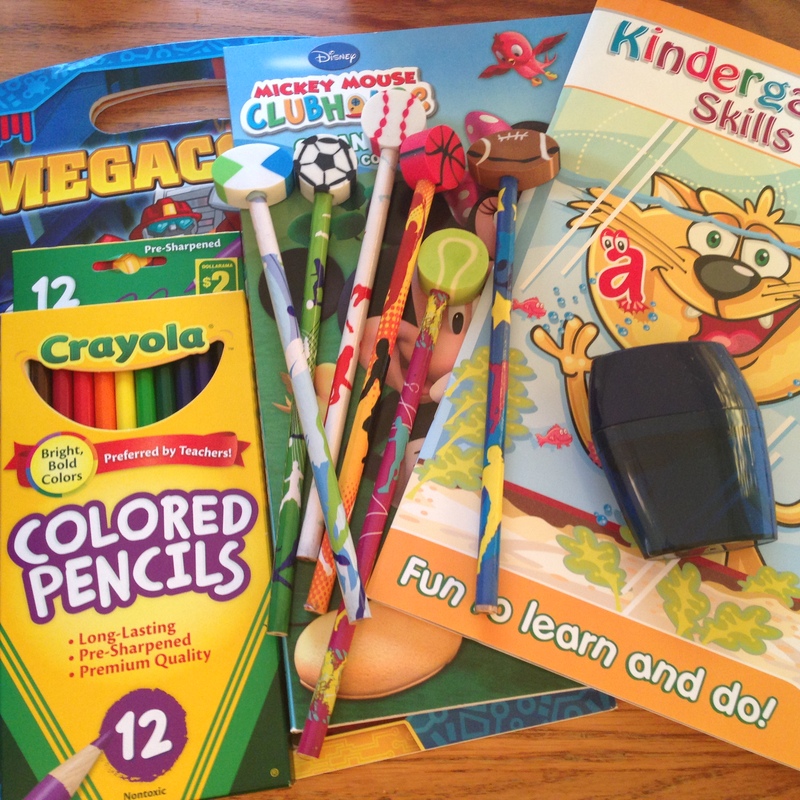 These are items specifically made to help those with fine motor cutting and writing issues and we could order them from a Canadian website called FDMT – Educational Materials and Sensory Tools (www.fdmt.ca). The order was shipped incredibly quickly (ordered Fri, received the products the following Wed) and I’ll be highlighting both so you can see how they work in the treatment plan. The scissors look like basic primary school scissors. Not very sharp, small openings, etc. 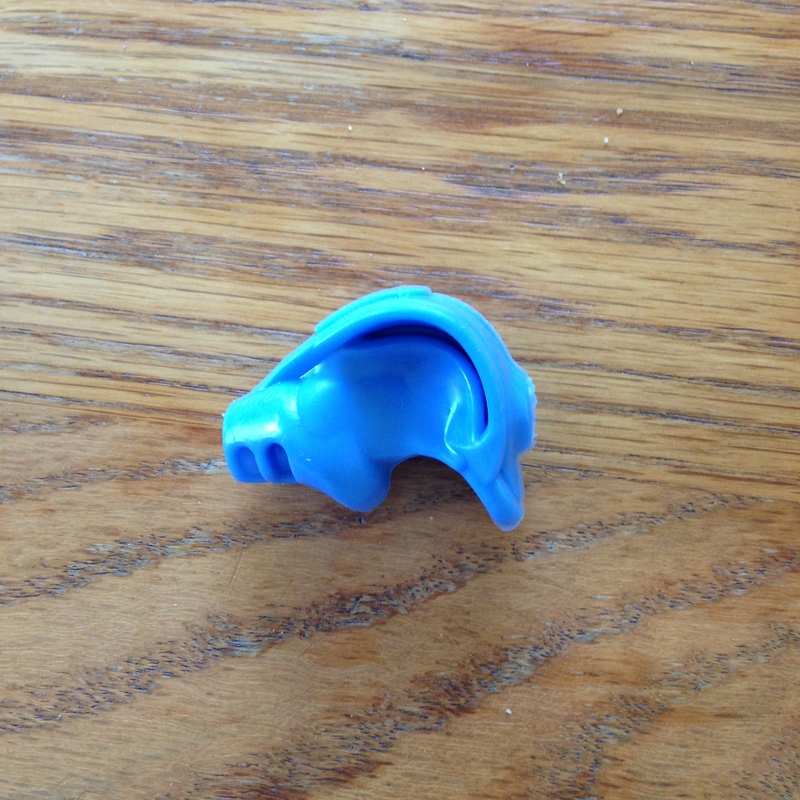 The big difference is that there is a curved piece of plastic on a hinge between the two loops. It can be moved up and down. 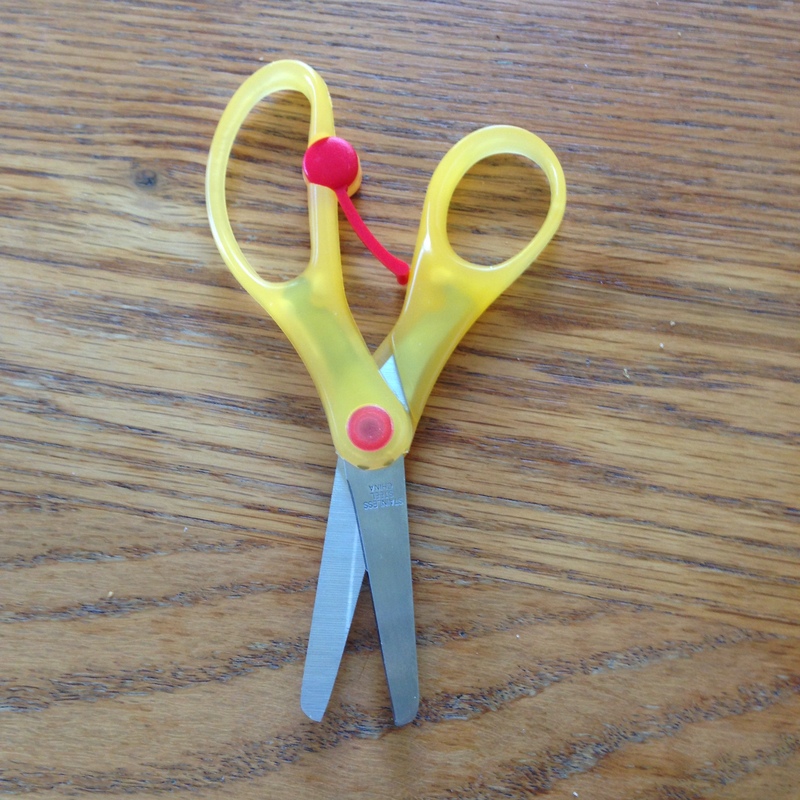 When it is up, the scissors work like normal; open and close, just like a regular pair. When it is placed down between the two loops however, the plastic helps the scissors open and close in a spring-like action, hence the name! It helps V create the smooth cutting motion and builds the strength and muscle-memory in his hands. 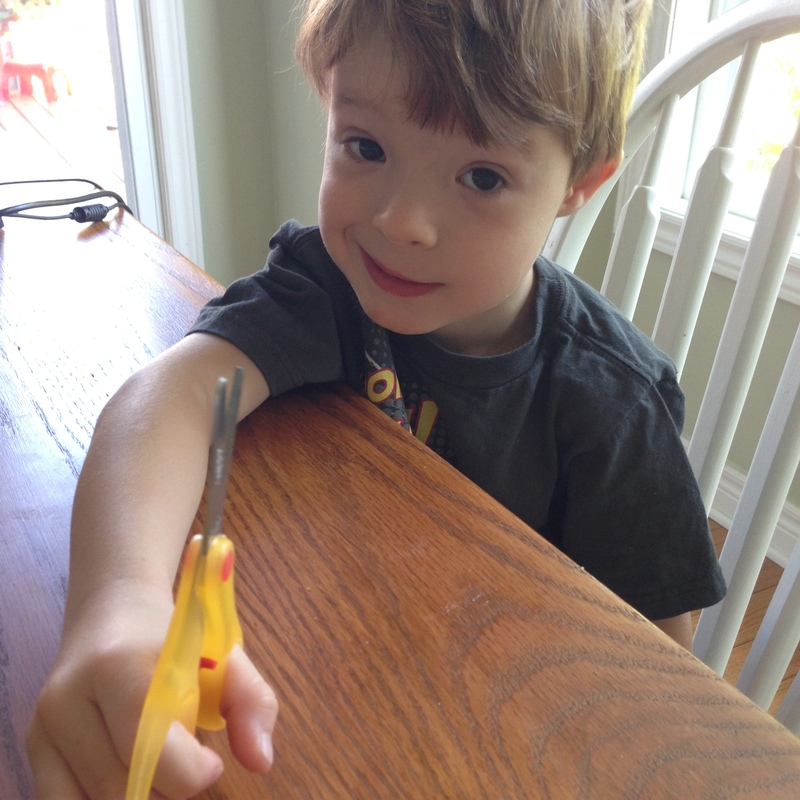 As he becomes more proficient and his hands more coordinated and strong, the plan is that he will eventually be able to open and close scissors on his own and will be able to use regular classroom scissors. Our daily ‘Cutting Skills’ materials. 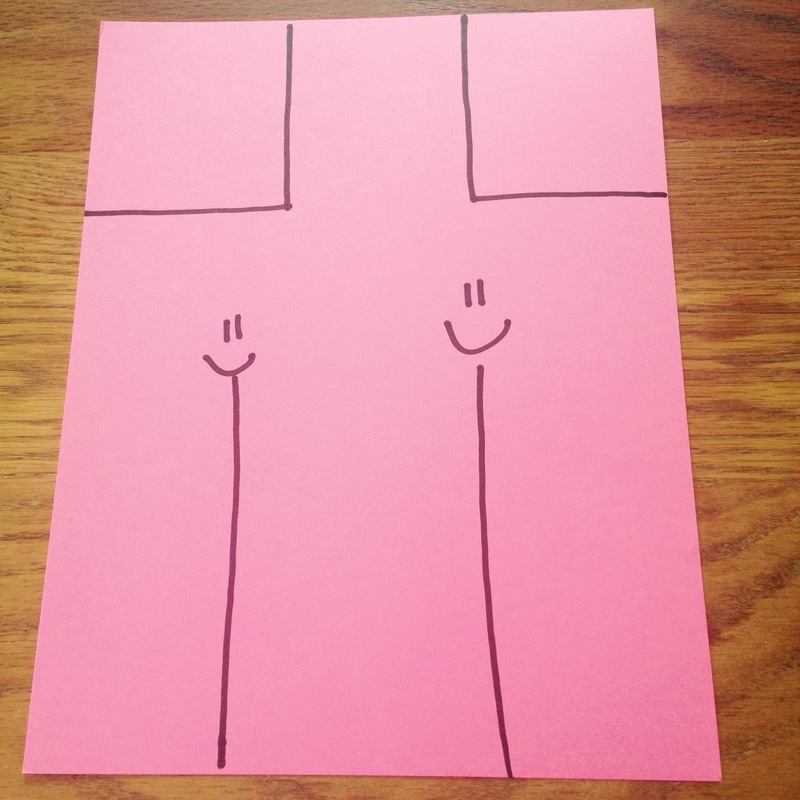 Similar to the assessment cutting exercises we will draw thick, short black lines on a piece of card stock and have V cut along the lines until he reaches the smiley face. We make the lines thick so he can experience success by actually cutting along the line. As he progresses the lines will progressively get longer and thinner until he’s able to cut along a fine line like his peers. We are also starting with me holding the paper for him as he cuts both lines but we’ll gradually move to him ‘helping’ me hold the paper, them him holding it himself. Results of our line cutting exercise! The lines are getting more smooth and a little more precise! V holds a plastic drinking straw in his left hand and uses his right hand and scissors to cut the straw into pieces. Sounds boring but we try to make it a game. I’ll ask him to cut me a big piece, small piece, ‘x’ number of pieces, a ‘sharp’ piece (cutting on an angle) etc. He really enjoys this one and you can use the pieces left at the end as a second fine motor activity by having your child thread them onto a shoelace/string. 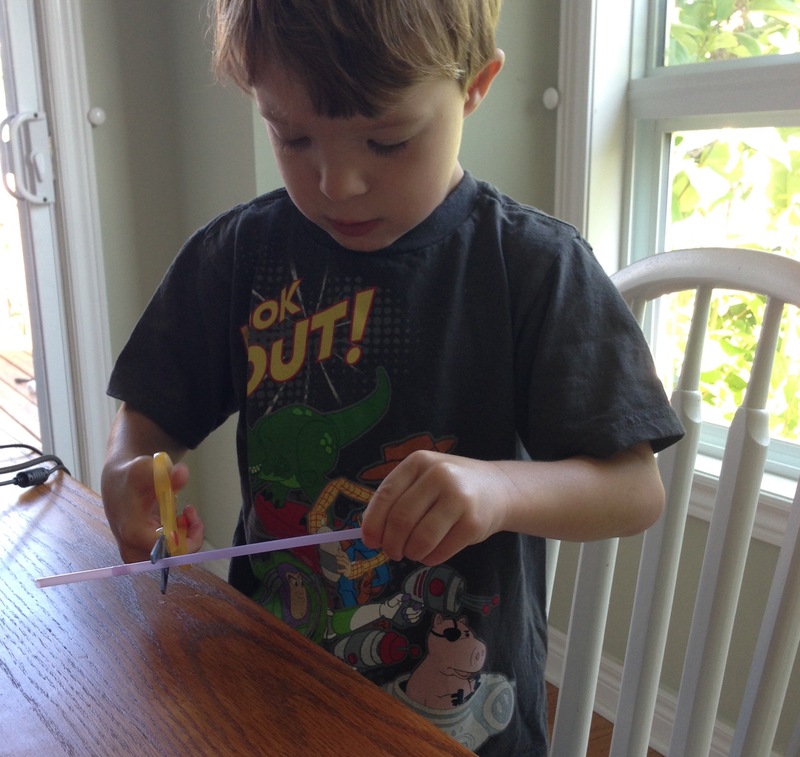 Holding the straw and cutting it into different sized pieces…little boys love a good ‘deconstruction’ exercise! 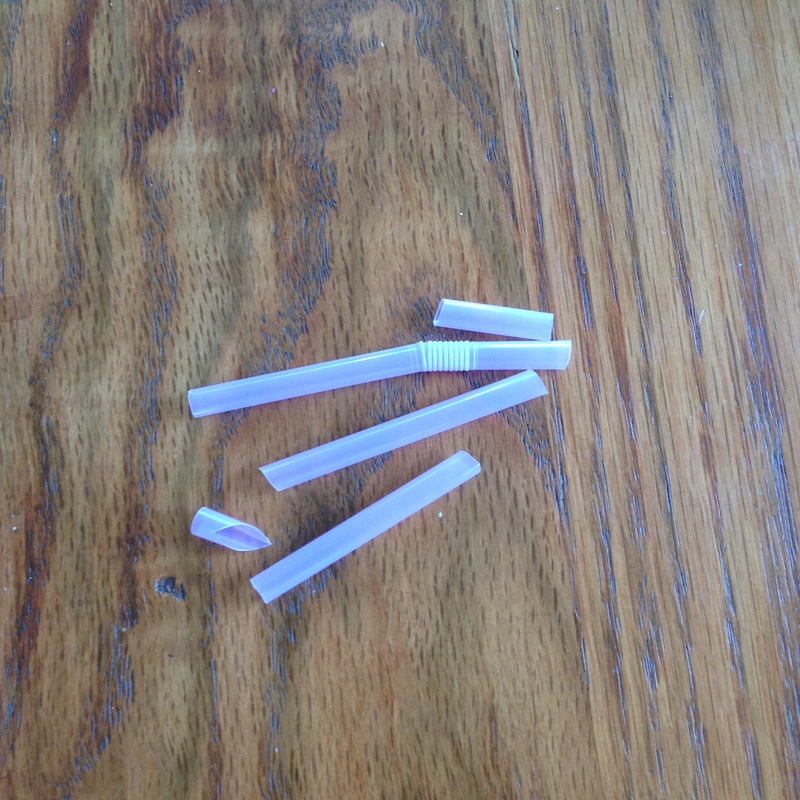 Results of the straw cutting. Put them aside in a seperate bag or container to use for a shoe-lace threading fine motor exercise! Nothing wasted here! I will roll a thick ‘snake’ of playdoh or therapy putty and have V cut it into different sized chunks. This helps him practice opening the scissors wide and making BIG cuts. It will usually take him 3-4 cuts to get through the roll and complete the section. 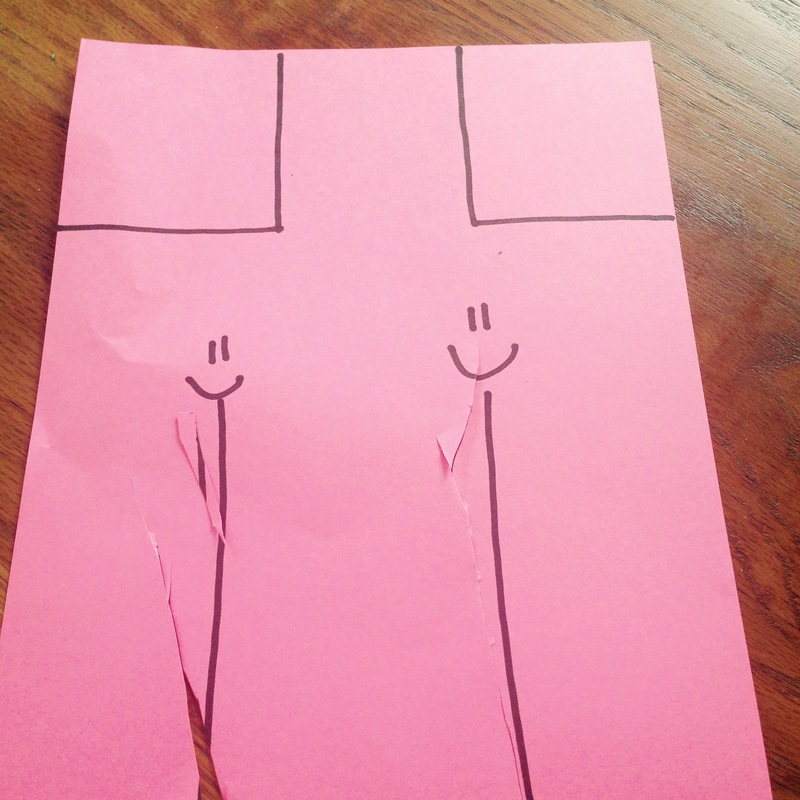 Make sure your child doesn’t ‘cheat’ and try to use the scissors to pry the halves apart, rather than cut! We ordered two pairs from the website. One is for V to use at home and one will be for his classroom in Sept so that he’s able to use his ‘special’ scissors when he participates in lessons that involve cutting. They will be labelled with his name and for his use alone. The scissors are right-handed. I’m sure you can find left-handed spring-loaded scissors but this is a right-handed world and the reality is that V will need to learn to manipulate them with his right hand. This is the only exercise that we work on his non-dominant hand. Similar to every other activity, sometimes V let’s his grip slip or become twisted. Don’t worry if you need to ‘reset’ the grip before each exercise or even each cut. This is all practice to build the skill, it will take time! 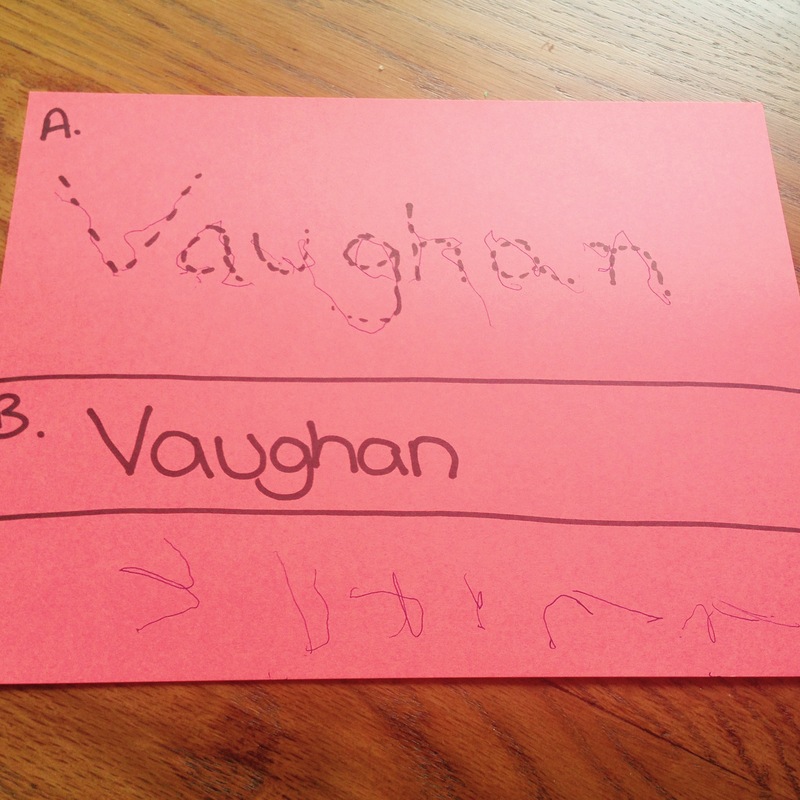 V doesn’t often show that he’s aware that he lacks a certain amount of control when he’s drawing, colouring or cutting. However since starting his OT he gets very upset when I hold the paper for him because he’s worried he’ll cut me. I have to spend a few minutes at the start of each session assuring him that he’ll do fine, he won’t cut all my fingers off and we’ll get through it. Make sure you don’t dismiss your child’s fears, they may sound a little bizarre to you but their imaginations run wild and they just need you to pump them up a bit and let them know it will all be fine in the end! The face I get every time we’re about to start cutting things up…still working on building up that confidence along with his fine motor skills. This is V’s favourite ‘game’ at the moment so I thought it would be a good place to start! 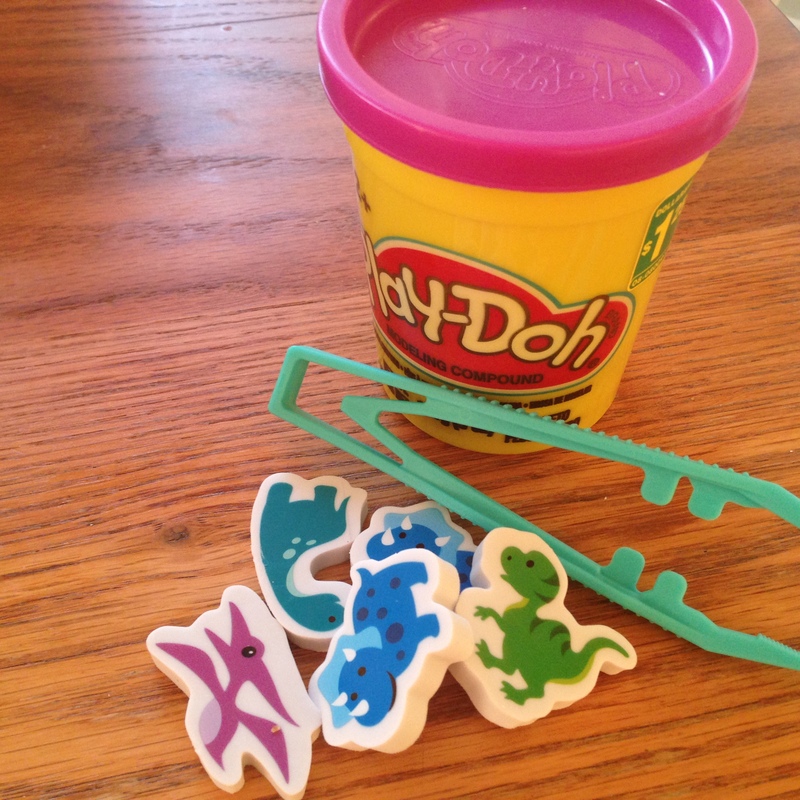 We chose to use purple Playdoh ‘ooze’ and dinosaur erasers from the dollar store but make sure you choose something your child would be excited about if you try this at home! Our occupational therapist says she often uses animals stuck in ‘mud’. Our ‘Dinosaurs’ game! No stabilizer in this picture because we usually just grab one of the dice from another kit. N.B. – ‘Pencil Grasp’ exercises will help V learn to individually control the separate parts of his hand. When you write you need to use the outer fingers to stabilize your hand and the thumb and inner fingers to grip the pencil and write. V uses his whole hand together as one grasp so he isn’t able to control the pencil to create any real forms. 1. 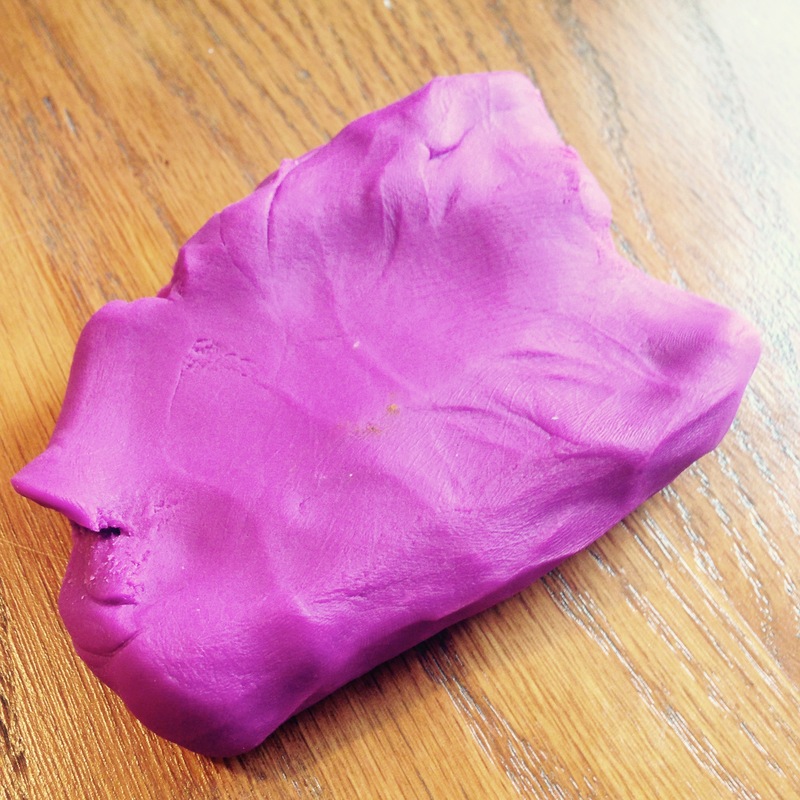 Shape the putty or playdoh into a thick, flat blob. 2. Stick the small objects into the putty/dough so they are approximately halfway submerged. Dinosaurs are stuck! Oh no! 3. 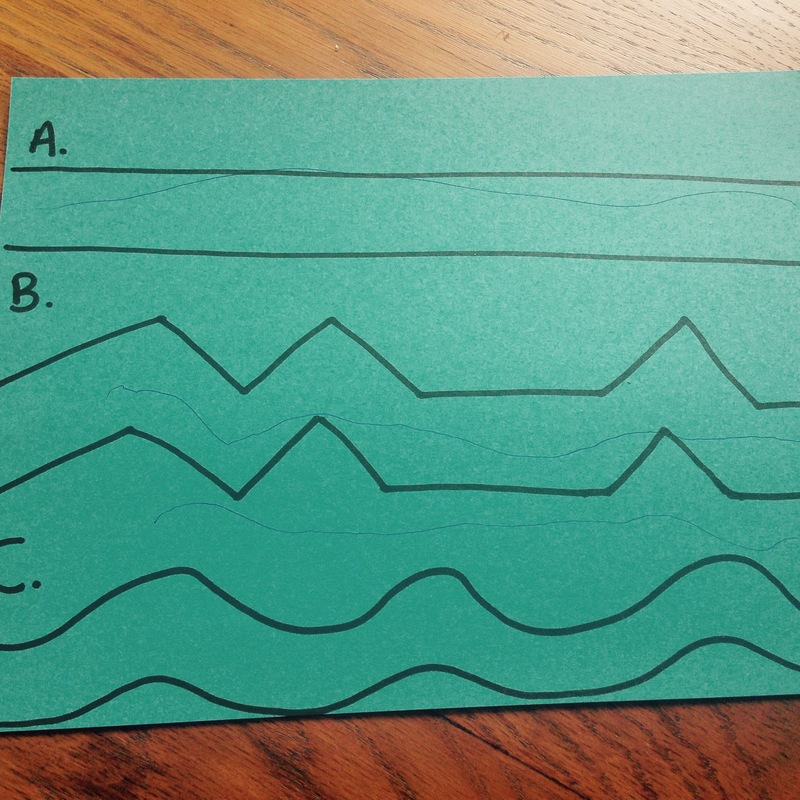 Help your child get a firm grasp of the stabilizer in their dominant (writing) hand. It should be held in the palm, almost hidden by the pinky and ring fingers. This helps them get used to not using those fingers in their pencil grasp. Stabilizer (dice) hidden in his palm under the outer two fingers. 4. 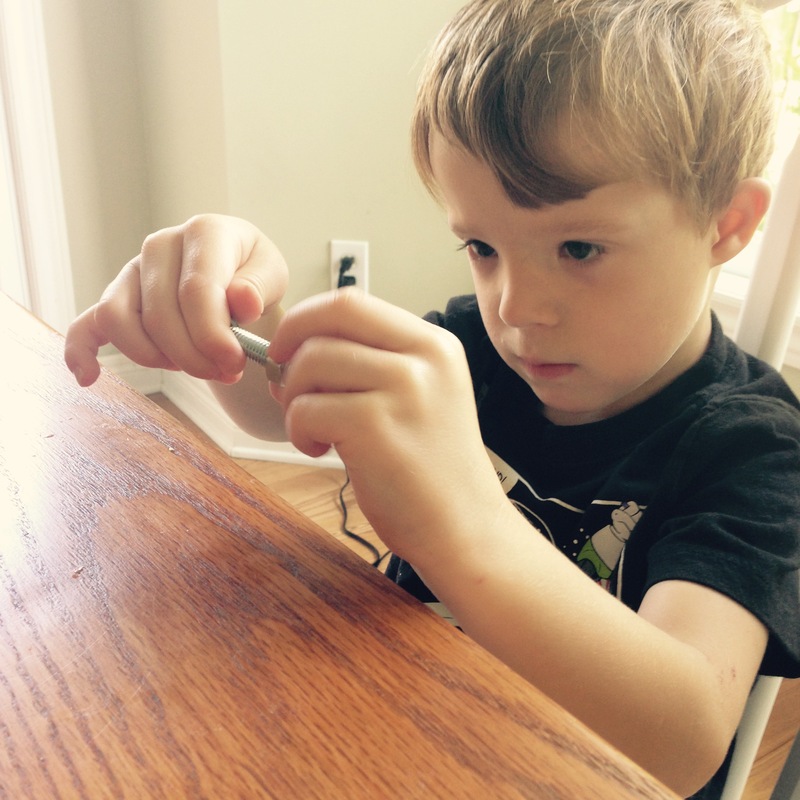 Help your child get a firm grasp of the tweezers. Thumb on the bottom, two pointer and middle finger on the top. Practice squeezing a few times so they get used to the action. Tweezer grip! Ready for some dinosaur rescue! 5. 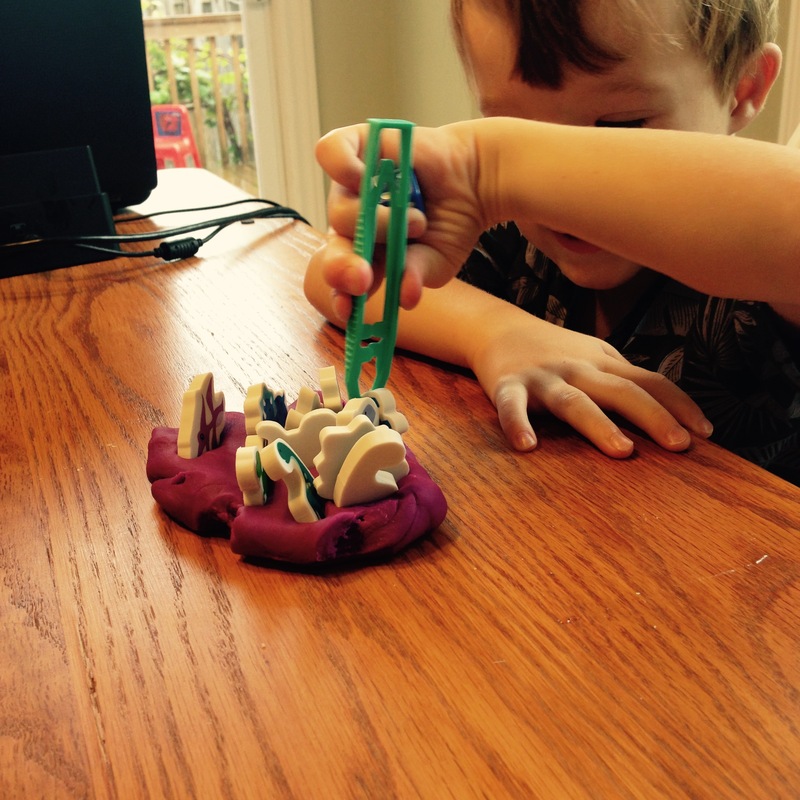 Have your child ‘rescue’ the objects from the putty by pulling them out with the tweezers. They will need to have a firm grasp and pinch motion to pull them out. 6. 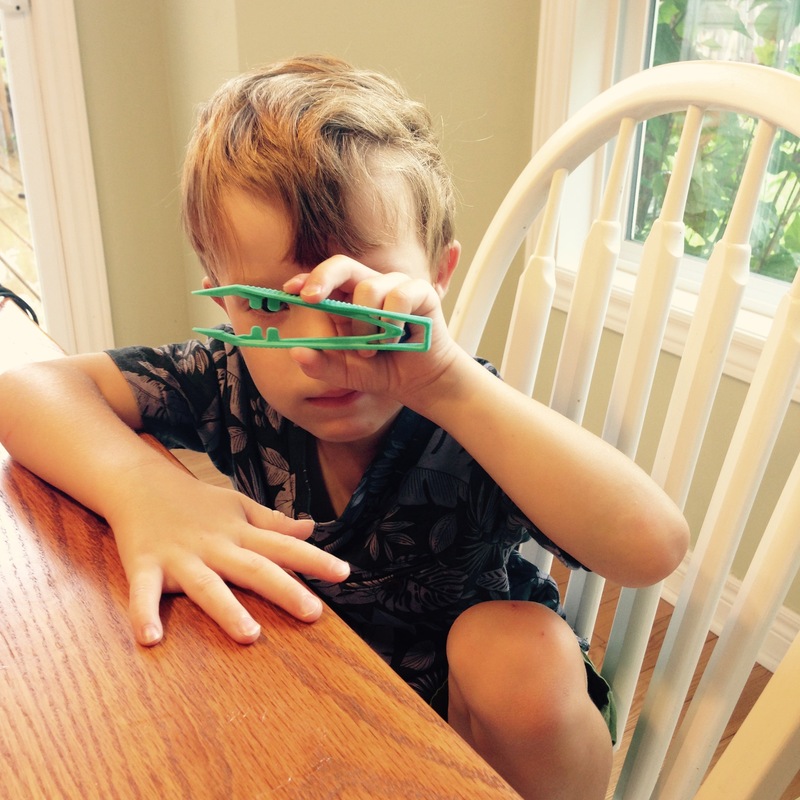 Have your child set each ‘rescued’ object on the table with a firm, purposeful motion. You need to see a controlled release rather than an accidental ‘drop’. 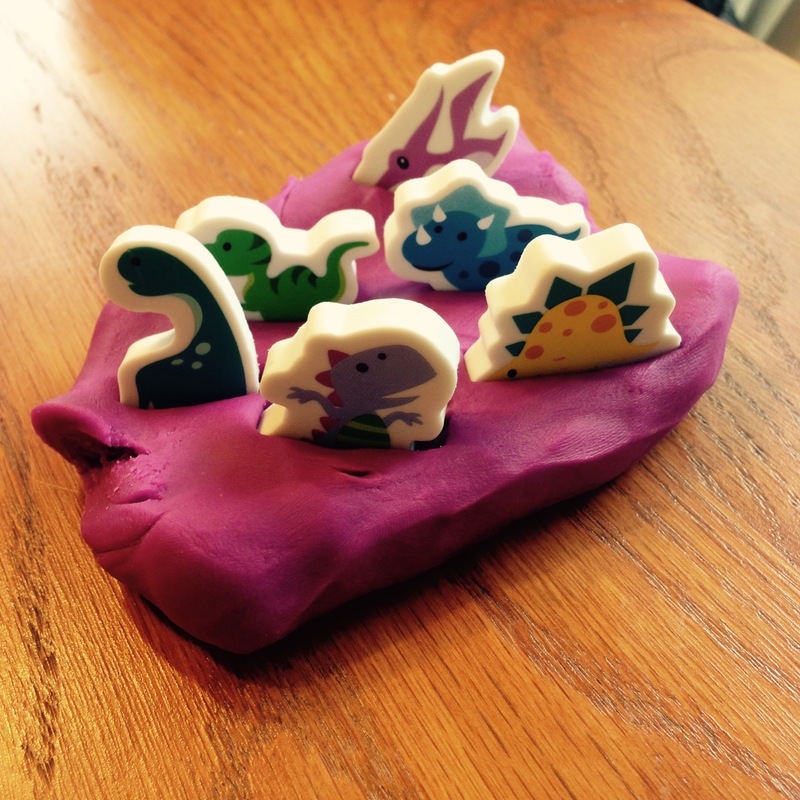 The ‘controlled release’: I ask V to put all the dinosaurs face up, which seems to help! 7. Repeat until all the objects are ‘rescued’. Done! Another successful rescue mission! Make sure that your child’s grip on the tweezers is correct before each ‘rescue’. V tends to let the tweezers slip into the crevice between his thumb and pointer finger and goes back to using his palm for control rather than the fingers. We ‘reset’ each time. Remind your child that they should only be using their dominant hand to do this exercise. It’s so tempting to add that second hand but it will decrease the effectiveness of the activity! Don’t be afraid to make your child repeat a rescue if they don’t use the correct grip/drop their stabilizer/drop the object on the table. This exercise is to help them build their coordination, grip and strength and doing it incorrectly is not the best use of your time or theirs! Start with a smaller number of objects and slowly work the number up. Again the key is for your child to experience success and when trying something new they can get bored/tired easily! After requesting an Occupational Therapy consult through our family health team in early June we finally got the call with about two weeks remaining in the school year. I was pretty pumped to get a jump on V’s needs for Senior Kindergarten and the therapist seemed very thorough and kind, even on the phone! She started by asking me what our concerns were with V and why we’d requested the consult. She listened actively which was a relief, since I originally felt pretty brushed off by our family physician. The therapist immediately recommended that I contact the school and request that V had Physiotherapy set up for Sept, as soon as school starts. One – V falls a lot, and since the school is aware that this happens, it is a liability for them if he falls, injures himself and they’ve done nothing to assist him. PT will help his gross motor development and hopefully have him running, jumping and generally keeping up with his peers in the playground/gym class. 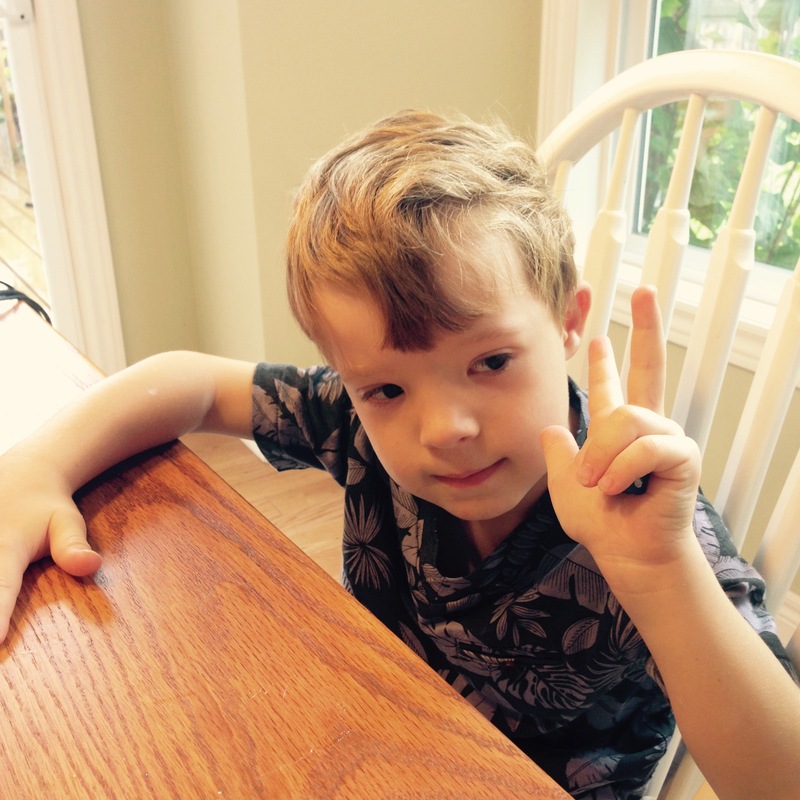 Two – The wait list for Physio is much MUCH shorter than the list for Occupational Therapy in the school system. There are fewer students with gross motor development needs and teachers are less aware that Physio is even an option in their classroom. As adults we typically only consider Physio in the context of injuries and rarely in relation to developmental issues. V’s teacher is an amazing educator and truly cares for her students. I let her know the Occupational Therapists recommendation and the paperwork for V’s Physio in the fall had been submitted and approved by the end of the week! One thing check off our list for back to school! The Occupational Therapist then scheduled our first visit so that she was able to evaluate V’s skills in person. She let us know that she would likely need two visits; one to evaluate and one to impart a treatment plan, and they would be about an hour apiece. We prepped V for the appointment by letting him know we’d be going to see a fun ‘doctor’ who was going to play some games with him. 4 year olds don’t distinguish between different medical professionals and since it was at our dr’s office…they’re all doctors in there! He was excited to go visit. 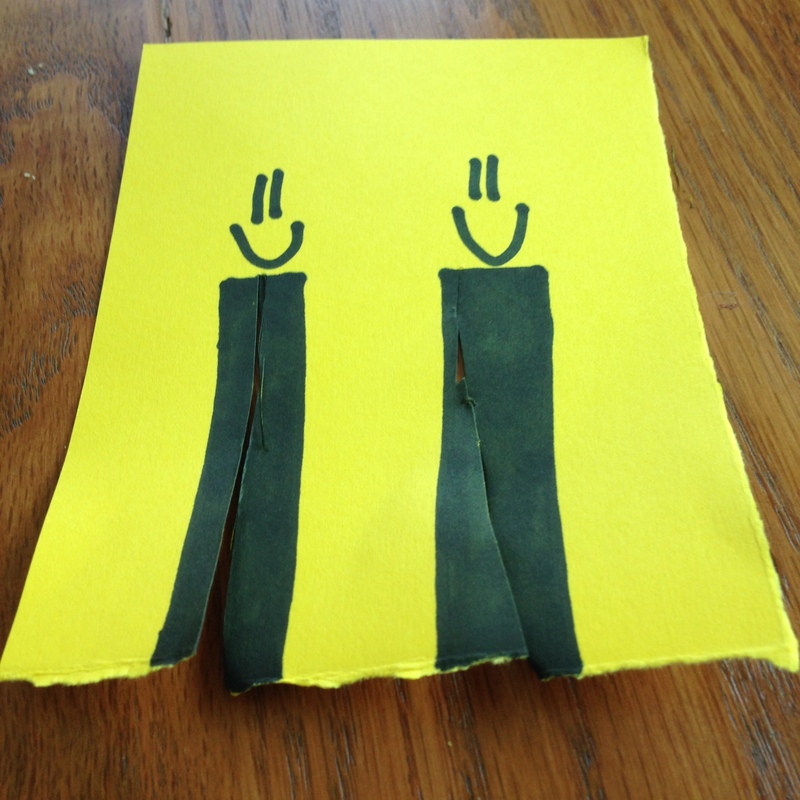 Cutting along a straight line (about half a page in length) with basic school scissors. She had him try to hold the paper and cut, and then she held the paper while he cut. Cutting around a right-angled corner with basic school scissors. She held the paper, then had him hold it, then she used coloured markers to mark where each of his fingers should be when holding the paper while he cut. Scissors worksheet example. Before the exercise. Trying to coordinate the scissors and his holding hand to cut a straight line. Also note that although he is left handed, he manipulates the scissors with his right hand. End result of the scissors exercise. You can see that he can’t cut a smooth or straight line right now. Tracing between two lines in different shapes using a pencil. 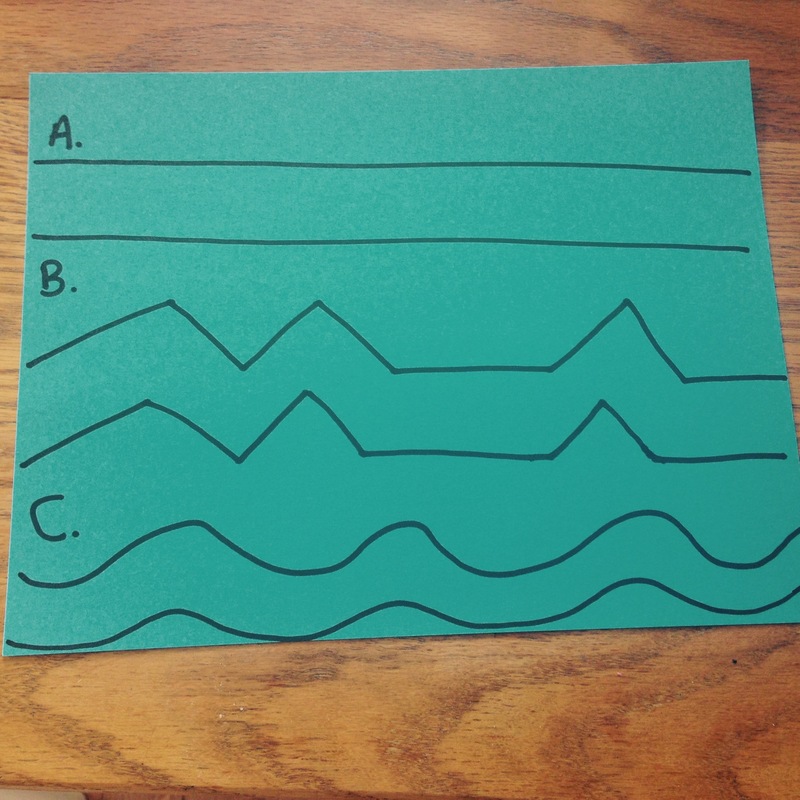 He had to trace between two straight lines, two lines with sharp V-like corners, and two wavy lines. Tracing on top of lines using a pencil. Again she had him trace straight, sharp curves and wavy lines. 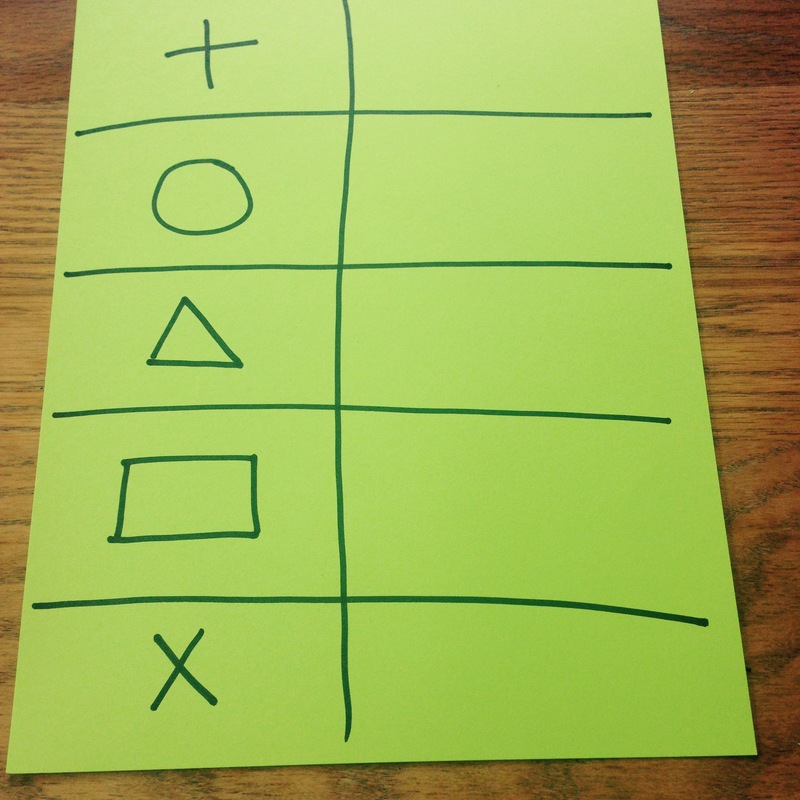 Pre-writing exercise by copying basic shapes: cross, x, square, circle, triangle. Copying the writing of his own name. She had him trace over-top of her writing and then try to copy it by himself. Line tracing exercise. The large gap between the lines is because we want him to experience success. The width will decrease over time. Note the bizarre, fist-type grip he uses because his fingers aren’t strong or coordinated enough yet. End result of the lines exercise. Notice there isn’t a lot of movement if he can help it. At the end of the exercises she gave us a quick evaluation of what she’d seen. 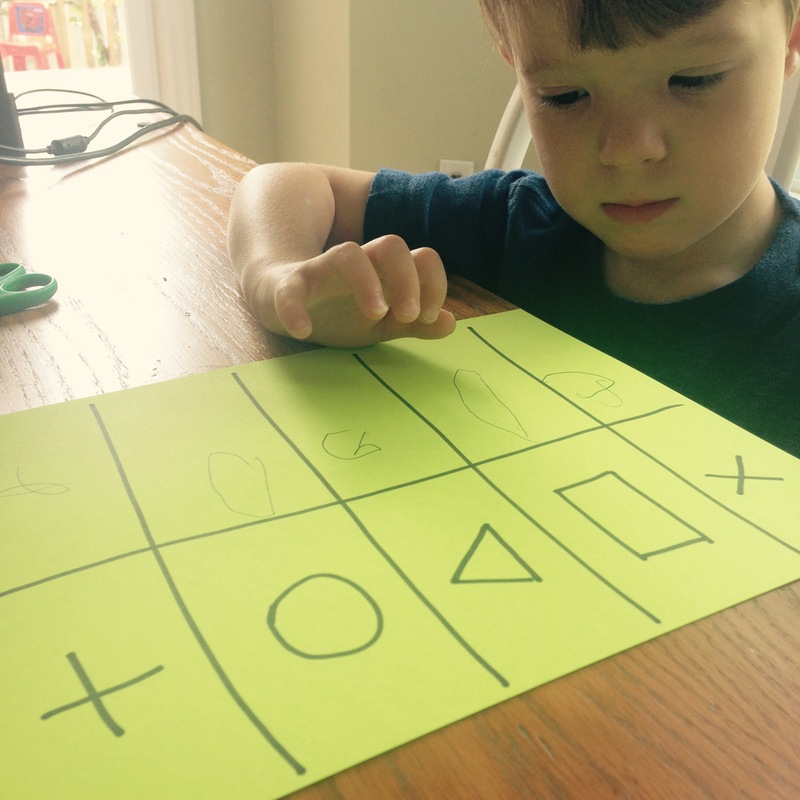 In V’s case she let us know that he has minimal fine motor skills and we’ll need to start right at square one to help him build up to where he needs to be by the time he enters Grade 1. Pre-writing exercise. 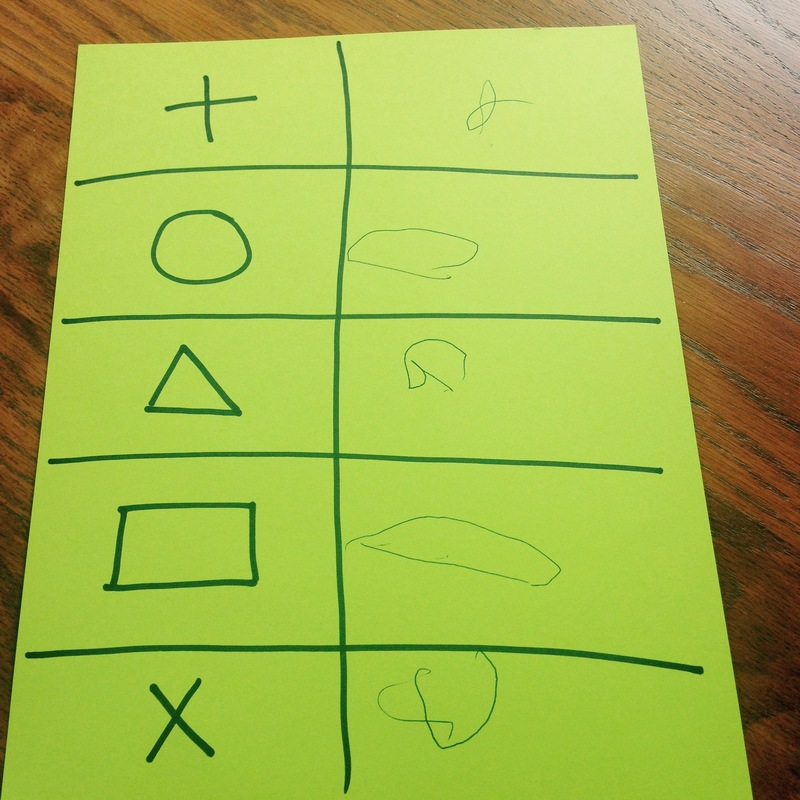 V needs to copy the shapes as close as he can in the boxes to the right. Examining his work. This one frustrates him the most. Pre-writing results. 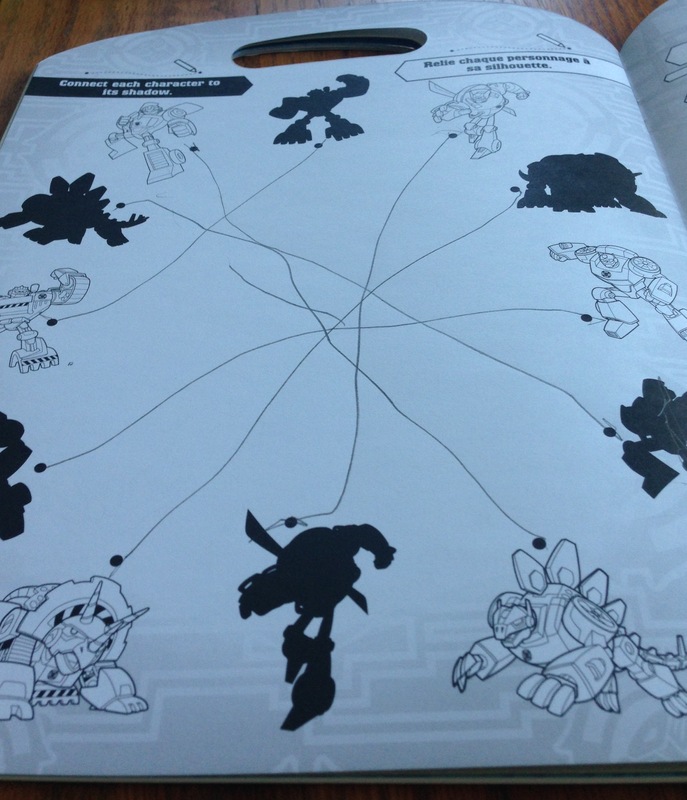 Notice that his shapes lack definition and tend to be pretty similar. They will improve as he learns to stabilize and control his pencil. V has little to no co-ordination in his hands. He struggles to even open and close the scissors in a cutting motion, let alone have the ability to cut along a line or co-ordinate both hands to hold and cut. V is also left-handed but cuts with his right. The OT told us this is very common in school aged kids because there are rarely, if ever, left-handed scissors consistently available in the classroom. 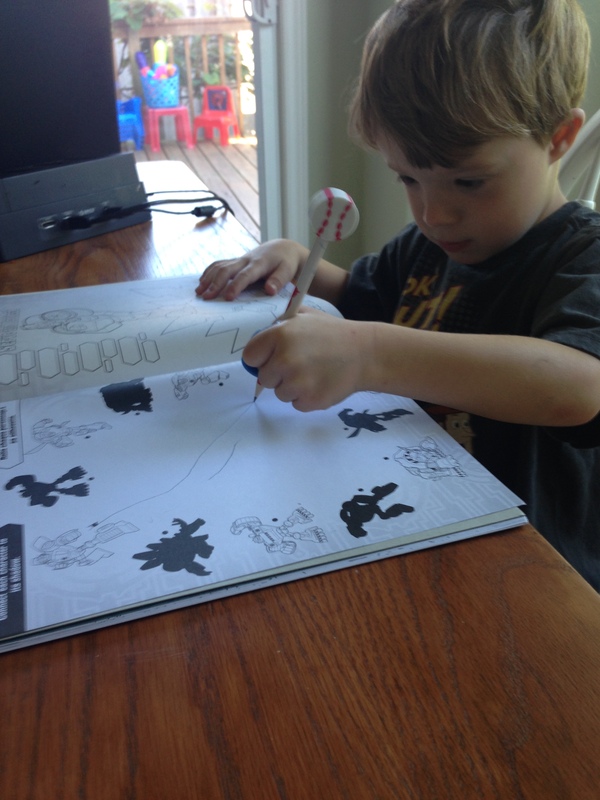 We aren’t going to try to modify this…he’ll be a left-handed writer, and right-handed scissor wielder! Writing exercise. He needs to trace his name and then try to copy it independently. Funny grip again! He really enjoys trying to write his name though. He’s almost got the V down. Writing results. We definitely have a few steps to go before he’s able to write legibly. As for writing he has no consistent pencil grip. He alternates from a fist, to a modified three-point grasp, to a bizarre grasp stabilized by his middle finger along the length of the pencil. 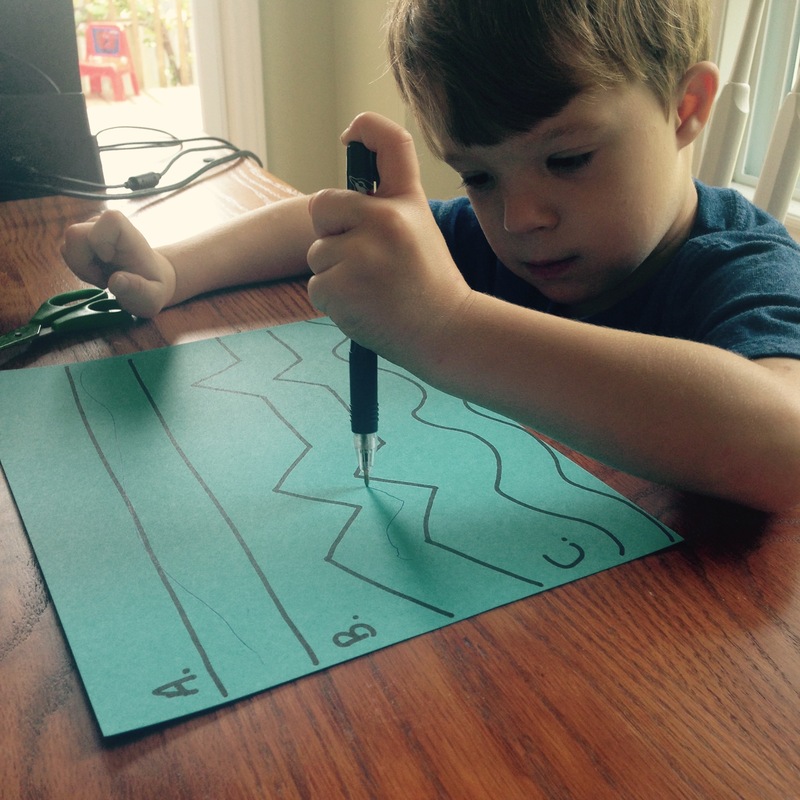 This stems from the fact that he can’t coordinate his fingers so that the far fingers are stabilizing his hand and the inner fingers and thumb manipulate the pencil. His whole hand works as one whole grasp. We’ll need to help him learn to co-ordinate his fingers and find a proper grasp before we can even move into tracing and pre-writing. The goal is to have him writing his name at the end of the year. There is no rushing this type of thing. We want him to learn consistency and co-ordination, not shortcuts to create the appearance of him learning.